Today was one of the nicer days we have had lately. for some old-school flying (I am 65 after all). 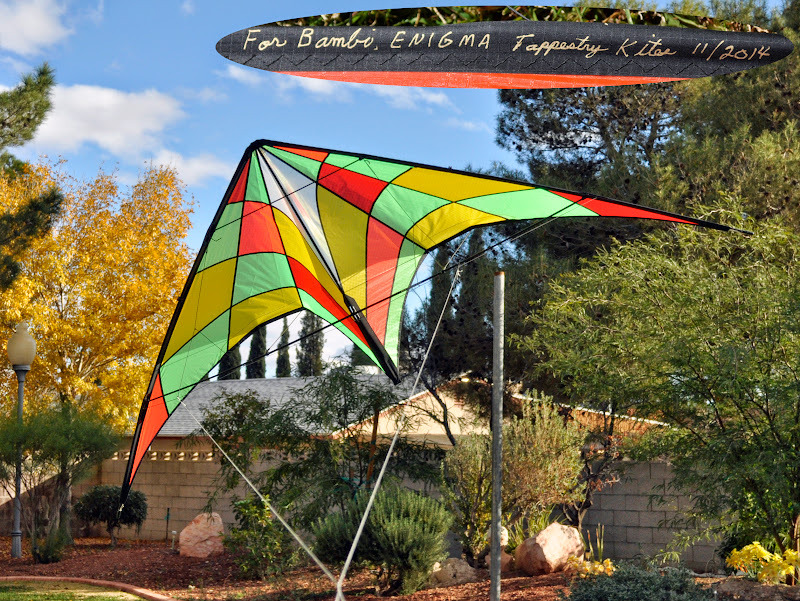 Kite Setup: No weights and ShapeShifter™ set to the inner mark. Visually, you have 26 panels and pin-striping so your imagination can get pretty creative. The wingtip tensioning is now adjustable done with a single line wrapped and vinyl end cap (very clean). handle a good 10 mph wind well. It's a solid build. have it here. The long standoffs provide a deep keel to carve through the air. sport kite? Sure, when it fits into an area on the graph that was vacant. Sounds like the kite has promise John It may require a bit more active flying but I find the best low wind lift and drive with the bridle stock on the third knot down and the SS out ~1/2" so there is 1/2" offset in the TE. YMMV. Good job. Congratulations. Video, soon ? I made an incorrect statement in the review shown above (now shown with strikeout). The sentence should read: The standard Enigma would do a barrel roll or backspin with no weights. one of your best pics skb, sans the apartment complex. Can't you put a nice mountain in the background? What about the apartment in the water? Mermaid under water holding the tip stab Enigma up. The standard Enigma would do a barrel roll or backspin with no weights. Like series STX 11years ago . JPC, you were way ahead of your time.